After numerous releases, the hack has come to a state I consider final: All known bugs have been fixed and the gameplay has been polished to the best of my abilities. SRAM files from any versions other than 1.30 or Final will *not* work properly with this release. Sorry, too much has changed. ADDENDUM: If you aren’t fond of grinding, then you can try this patch for an Easy Mode. 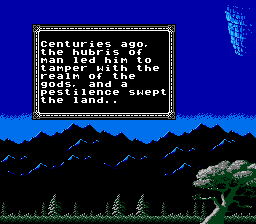 If you don’t know it by reputation, DXΩ2 is the Alpha & Omega of NES RPG ROM hacks. Skeptics, believe the hype. 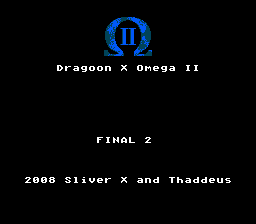 SliverX’s .ASM talents and Thaddeus’s graphic designs make this sequel to the already-groundbreaking DXΩ1 a crowning achievement in ROM-hacking. As for any menu-based RPG though, I do recommend using an emulator with turbo-A and a Speed button for level crunching. Story: Takes place long long after DXΩ1 on a new planet. The story pretty good, and DXΩ1 fans will enjoy the ending. Graphics: Thaddeus’s work is beyond reproach. Backgrounds look meticulously made. Some enemy designs look like a nod to H.R. Giger. Sound: Yes, this has all original music! -and it’s not irritating chopped-up loops either! Challenge: It is rather challenging, but the battle system has been refined a couple of times since I’ve played it.